Whether you are making new hires or simply clarifying responsibilities and qualifications with existing staff, this Sales Representative Job Description will make sure that everyone is on the same page. Maintains database of clients and orders. Establishes new client relationships when possible. Experience in a customer service environment. 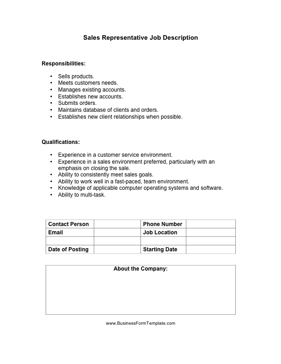 Experience in a sales environment preferred, particularly with an emphasis on closing the sale. Ability to consistently meet sales goals. Knowledge of applicable computer operating systems and software.